With AMD taking away all the fame with their recently launched “Never Settle Reloaded Bundle“, it felt as if NVIDIA just wanted to back out from the game. However, NVIDIA has redeemed itself with the launch of its own promotional deal known as the Free 2 Play Bundle which is available on all GeForce Kepler products. The Free 2 Play Bundle doesn’t include any new games such as the upcoming Crysis 3, Bioshock: Infinite or Tomb Raider which are included in the Never Settle Reloaded bundle but provides users with in-game cash on NVIDIA optimized games which include the highly successful MMO from SOE (Sony Online Entertainment) “Planetside 2”, the PhysX powered mech shooter “HAWKEN” and another massively popular F2P title “World of Tanks”. If these names are not familiar to you than do know this much that these F2P titles are PC exclusives and are the recently most popular online titles to be released. The games being Free 2 Play rely on in-game transactions for revenue, through in-game purchases you can buy new items, weapons, etc which would help you in your gameplay. NVIDIA with their Free 2 Play Bundle gives you a headstart of upto $150 in-game redeemable cash which you can use to buy items upon purchasing a GeForce product. With GeForce GTX 650 and GeForce GTX 650 Ti, you get $25 in-game cash in all three titles. With the purchase of GeForce GTX 660 and above GPUs, you get $50 in-game cash for all three games. 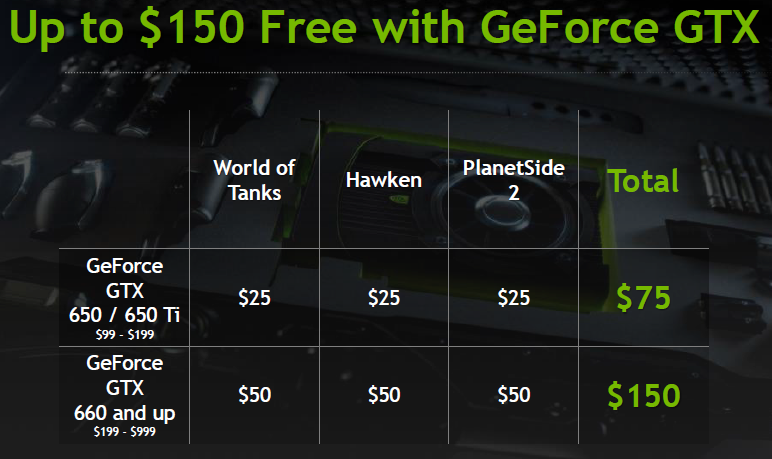 Simply this means with GTX 650 and the Ti model, NVIDIA gives you $100 value of their Free 2 Play bundle, a GTX 660 or above GPU means you’re getting a $150 value off your purchase. You aiming for SLI? than you are getting yourself $300 off the GTX 660+ GPUs and $200 off the GTX 650/ Ti models. In the last NVIDIA slide, the company mentions that almost 36 million PC gamers don’t meet the recommended specifications for these F2P titles hence investing in a GeForce Kepler GPU now might not be a bad idea after all. Create a new account and apply your invite code here. Then follow these instructions to apply your bonus code. Follow these instructions to apply your bonus code.